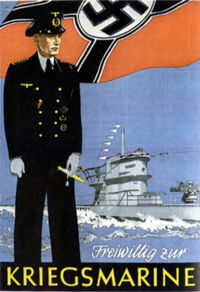 Poster asking Germans to "Volunteer with the Kriegsmarines"
The Kriegsmarine was Germany's Navy during World War II. It consisted of several capital ships and the infamous U-boat groups. The U-boats were widely feared and very destructive. Its codes were cracked in 1941 and was taking heavy casualties, but made new codes in later 1941 and inflicted many Allies casualties. In 1943 the last codes were cracked and all that was left of the Kriegsmarine was drawn back from the Atlantic Ocean. This page was last modified on 27 June 2016, at 00:08.